The Pentagon said Thursday it was seeking a $1.2-billion funding cut in missile defense spending for fiscal 2010. Immediately following Barack Obama’s election last fall, Moscow went on a gigantic public relations campaign to persuade the new administration to cut back on missile defense — including the system planned for Poland and the Czech Republic. 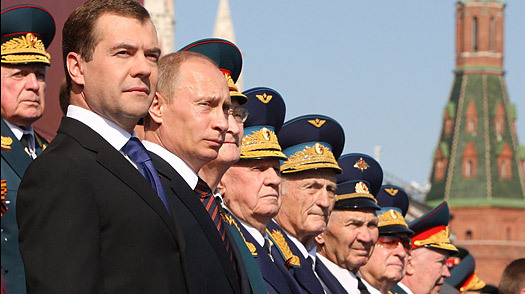 Russian President Dmitry Medvedev (L) and Prime Minister Vladimir Putin attend the Victory Day parade at Red Square in Moscow May 9, 2009. President Medvedev warned against “military adventurism” on Saturday, saying Russia would firmly defend its interests — just as it did during World War Two when the Soviet Union defeated fascism. Consequently, many European allies see the U.S. as not really interested in missile defese any more. And the Administration backed away from military planners who suggested the U.S. should shoot down the last long range North Korean missile test. (AFP) — Russia on Saturday sternly warned its foes not to dare attempt any aggression against the country, as it put on a Soviet-style show of military might in Red Square including nuclear capable missiles. The display to mark the 64th anniversary of the Soviet victory over Nazi Germany in World War IIcame amid renewed tensions with Georgiaafter NATO’s decision to hold war games in the Caucasus country infuriated Moscow. “We are sure that any aggression against our citizens will be given a worthy reply,” President Dmitry Medvedev said in a speech in Red Square side-by-side with powerful Prime Minister Vladimir Putin. Military vehicles move along Red Square in Moscow during the Victory Day parade May 9, 2009. 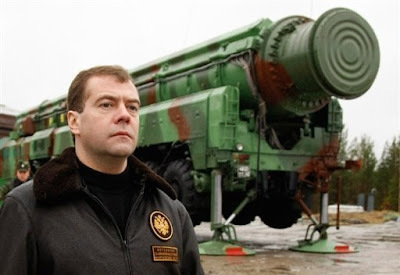 President Dmitry Medvedev warned against “military adventurism” on Saturday, saying Russia would firmly defend its interests — just as it did during World War Two when the Soviet Union defeated fascism. Medvedev, opening the biggest and most spectacular Victory Day parade in modern Russia’s history, clearly aimed his warning at post-Soviet neighbour Georgia which Russia defeated in a five-day war last August. “The victory over fascism is a great example and a great lesson for all peoples and is still current today when people are again starting military adventures,” he added. Russia’s war with Georgia in August over Georgian breakaway regions sent Moscow-NATO ties to their worst level since the Cold War and tensions have flared again over the alliance’s decision to go ahead with the exercises. Moscow, which remains at loggerheads with Georgia’s pro-Western President Mikheil Saakashvili, angrily condemned the war games that started this week as a provocation that risk stoking instability in the region. Before handing over to Medvedev as president last year, Putin resurrected the Soviet practice — dropped after Communism — of having missiles and heavy tanks rumbling over the Red Square cobbles in front of Russia’s leaders. Thousands of soldiers and more than 100 items of hardware featured in the Red Square parade, which was matched by similar demonstrations across Russia involving almost 30,000 troops, officials said. Thousands of soldiers marched past Medvedev and Putin, before dozens of heavy tanks, including the main T-90 battle tank and the Sprut self-propelled anti-tank gun, thundered through Red Square to the sound of martial music. A top executive at Lockheed Martin Corp. indicated Tuesday that it has accepted the Pentagon’s proposal to cap production of the defense contractor‘s F-22 fighter jet, the latest sign the job-heavy program may not be revived. Defense Secretary Robert Gates has proposed that the Pentagon buy 187 of the planes, short of the 20 to 60 more that Lockheed and its supporters in Congress had hoped for. The Gates plan was endorsed last week by to Air Force officials, who previously pushed hard for many more of the technologically advanced but costly planes. As lead contractor on the jets that cost $140 million each, Lockheed has warned in a public relations blitz that capping the F-22 could lead to up to 25,000 job losses at the company and other suppliers working on the program. 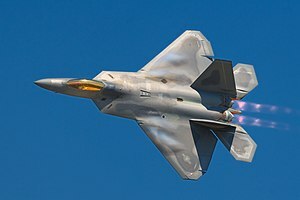 The F-22 assembly line at Lockheed’s Marietta, Ga., aircraft plant likely will turn out the last plane in 2012 if Gates’ plan, which must be approved by Congress, goes into effect. 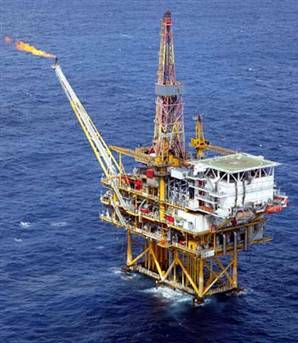 “We are disappointed by the decisions, but we will accept those and go on,” Tanner said. Frank Gaffney of the Center for Security Policy wrote that President Obama is gutting an important part of the U.S. defense budget by cutting America’s power-projection capabilities. For example, Mr. Obama and Mr. Gates propose to cancel the C-17, America’s indispensable airlifter; the F-22, the world’s best fighter/attack aircraft; and the Army’s Future Combat Systems program, a comprehensive and long-overdue modernization program for that service’s armored forces. They would also truncate the purchase of F-18 E/Fs, the backbone of naval aviation, evidently as a precursor to reducing the number of operational aircraft carriers. Missile defense programs will be ravaged. There will be no modernization, ever, of the nation’s nuclear deterrent. And the industrial base needed to support all of the above will be allowed to atrophy and/or be sold off to foreign powers keen to manufacture the superior weapon systems we no longer will. Human rights still appear to be a luxury in Russia. Recently, Lev Ponomaryov, director of the Moscow-based Organization For Human Rights, and a leader in the new political opposition movement Solidarity, was reportedly beaten by a group of men outside his home . Stanislav Markelov, whom the Wall Street Journal called one of Russia’s top human rights lawyers, was murdered in late January, as was Anastasia Baburova, a 25-year-old freelancer for Novaya Gazeta, which, according to the New Zealand Herald, is the last major publication critical of the Kremlin. Novaya Gazeta also lost three other journalists in the last decade– Anna Politkovskaya, Yuri Shchekochikhin, and Igor Domnikov. The problem runs very deep in Russian culture, stemming back centuries with only one person in charge. It is one dilemma that will not be resolved for a very long time. Shortly after our arrival to the U.S., my parents attended several job search skills seminars for recently arrived immigrants. In one of these sessions, the issue of employee rights and how they are treated in the workplace came up. My parents were surprised to discover how much respect for individual employees was emphasized–the idea was so new and foreign. When I spent a week in Moscow this past March, a journalist, and a friend of my father, told me that I’m lucky because I can say what I think, implying that is still not possible in Russia – at least not without the fear of persecution that could potentially follow. He proceeded to explain how Pushkin would veil certain criticisms of the czar in his poetry, since it was not possible to do so outright. It is true–a publication like Novaya Gazeta could not have existed during the Soviet era. But the Russian government mainly allows it to exist because it serves certain purposes, such as creating an appearance of free press. In a country that was built, after its last czar was killed, on the idea that everything was “for the person, by the person, and in the name of the person,” as one Soviet slogan went, it seems everything still is indeed “for the person”– the same person whom, according to a Soviet-era joke, one man from rural Russia saw for the first time when he went to the Red Square.